● Real-time share your location to friends and family. ● You can use in driving, travel or to get rescue when you get lost. 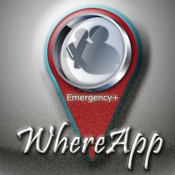 ● Open your WhereApp protect your safety. ● Destination Alarm: Don't miss any important landmark. 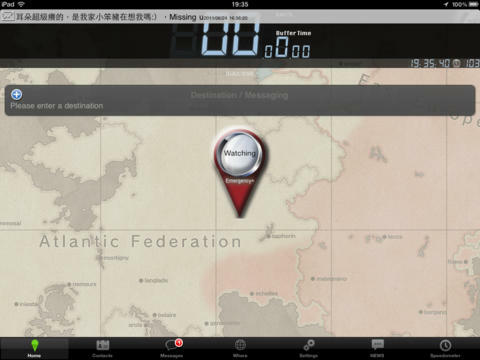 ● Continued use of GPS running in the background can dramatically decrease battery life. ● Make sure your travel safe, turn WhereApp keep your address in the most needed relief can be achieved. 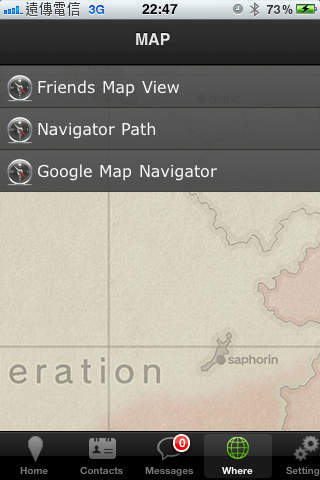 ● Share your location to your friends or family by SMS/Email. ● Approach : WhereApp will upload location data to WhereApp Server. ● Send messages to your friends or family. ● Real-time to watch your geographic information. ● Send message to you. ● Web based viewer, support any device. Join us facebook to get help.